I’m standing on the edge of the Sierra Negra volcano on Isla Isabela in the Galapagos Islands, feeling as small and insignificant as I’ve ever felt. With its crater of 10 kilometers across, the sheer power, potential and enormity of this beast – one of the world’s largest active volcanoes, left me silenced in awe of nature’s absolute authority. At an estimated 535,000 years old, it is one of the mothers of the Galapagos Islands, a quirky conflicting source of both birth and destruction. The highlight of the volcano is the caldera – which is the massive circular indentation left by the collapse of the earth caused by the volcanic eruption. To put this beast into perspective, the circumference of the caldera’s ridge is 30 kilometers. That’s over 19 miles, the better part of a marathon, if one were to be so foolish as to attempt to run or walk around the thing. Our guide, Javier, has never done it, but he said a couple of his friends make the trek over the course of a very full day.To put this beast into perspective, the circumference of the caldera’s ridge is 30 kilometers. That’s over 19 miles, the better part of a marathon, if one were to be so foolish as to attempt to run or walk around the thing. A panorama of Sierra Negra’s caldera. Our guide, Javier, has never done it, but he said a couple of his friends make the trek over the course of a very full day.We embarked on a five-hour trek from the base of the volcano along its southern ridge, to the edge of the caldera to the north, and down its east side to Volcane Chico – so named due to its role as one of the offsprings of Sierra Negra. We continued through the rugged lava fields left from the massive lava floes from Sierra Negra’s last eruption in October of 2005, laboring over small rises and craggy valleys along the mountainside and back. 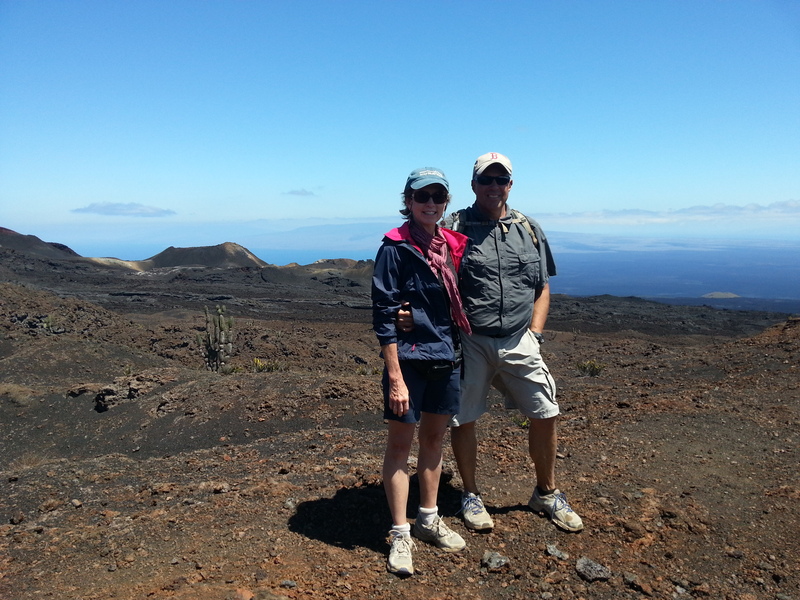 It’s only a vertical climb of several hundred meters to the volcano’s caldera and a mere 8,000 total meters of hiking (roughly five miles), but it felt like a lot more. Our feet crunched on the uneven path composed of tons of volcanic ash, creating a metallic sound that defies the ash’s composition as rock. Immense lava fields of pointed black rock are stippled with iron-rich deposits, some of which form fascinating swirls that hardened in the Galapagos sun after one of the recent eruptions. Before Sierra Negra’s last eruption, it had lain dormant since 1979, both times spewing vast oceans of lava through several fissures to the volcano’s north side. The nine day eruption in 2005 sent millions of square meters of molten lava stretching from the volcano onward. Gabi stoops to put her hand into the thermal vent near Volcane Chico. There is no life other than flora to the north of the volcano, so the lava simply filled in valleys and rolling hills that sweep from Sierra Negra to Bahia Elizabeth. It has formed an impenetrable wasteland of sharp lava ridges and plunging formations; sprawling fields of lava that look like black rock equivalents of the ice floes that break apart to form Antarctica’s immense ice fields. We approach the edge of Volcane Chico with great caution, closely adhering to our guide’s suggestion that we remain at least one meter from the edge of the crater. None of us wants to consider the fate of falling into the yawning maw of nature’s inferno. It is hot here, but only from the relentless Galapagos sun. Small pockets of volcanic thermal gas create hot vents that pop up along the trail, and we stop to feel the heat that has remained from its voyage from far beneath the earth’s crust to the surface. The crater of Volcane Chico. To get a sense of the scale, look carefully just outside of the crater’s rim at 1 o’clock to see people hiking the lava field. We stop for lunch beneath one of the trees whose species was introduced centuries ago by explorers to the Galapagos, thankful for the spreading branches and shade-producing leaves. Tiny yellow warblers stand patiently and fearlessly at our feet, awaiting the inevitable dropped crumbs. The colors around us are startling. Deep black lava is painted red by veins of iron-rich ore, as if to pockmark Mother Nature’s face with a large-scale case of angry acne. The rich greens of ferns and small bushes that have gained a foothold along the caldera stand in stark contrast to the rich blue skies under the Galapagos sun. White fog runs up the southern ridge of the volcano and plunges into the caldera as we stand on the edge, jaws agape and stunned by the purity of nature at its wildest. The fog dissipates as quickly as it arrives, revealing the enormous caldera, the green ridges, black lava and blue skies above. Nature’s paintbrush has never been so generous with primary colors, never so liberal with its brush strokes of acute texture and fibrous detail. Molten lava cooled to this twisted block of rock with fascinating swirls and details. We ambled our way back to the ranger station mostly in silence, stopping frequently to stretch and ease the pain of the arduous hike. I’ve been dealing with a pesky case of foot tendinitis for a few weeks, and there’s nothing like a hike into the thick of the Galapagos to put a partial recovery to the test. Our tour company had sent one too few pickup trucks to provide the 40 minute ride back to town, so I hopped into the back of one and settled in for the bumpy ride. It was the perfect end to the day, a chance to reflect, etch the memories of the experience deeply into my consciousness, and appreciate the gifts of nature that leave one feeling very, very small, but extremely connected to the universe. Went to Ecuador a few times, but never enough time to go to the see the Galapagos Islands! !